My alumni association got a tour by the curator of the One Life: Dolores Huerta exhibit at the National Portrait Gallery. Go see it! It is great. It’s in a very tiny room, but she has a really fascinating story. “One Life: Dolores Huerta” will highlight the significant role of this Latina leader in the California farm workers movement of the 1960s and 70s. This eleventh installment in the “One Life” series is the first devoted to a Latina. 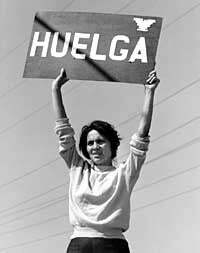 It will illuminate Huerta as the co-founder, with Cesar Chavez, of the United Farm Workers (UFW), and highlight her position as the union’s lobbyist and contract negotiator. Huerta was instrumental in achieving major legal protections and a better standard of living for farm workers, yet she remains largely under-acknowledged in history. The exhibition is the first in a national museum to draw attention to her contributions. Opening in July 2015, the exhibition will coincide with the 50th anniversary of the September 1965 grape strike launched by the farm workers movement. And if that’s not enough for you, you can see her interviewed on Sept 24th as part of their Living Self-Portrait series! I wish I could attend the interview, but I have class. So everyone else should go see them! Everyone knows Chavez, and its about time Huerta got her due.